Early autumn in Central Texas is something to behold. Texas boasts some of the country’s best places to retire. Those searching for a 55+ community will have many options to choose from in this warm state. Check out the 10 best active adult communities in Texas that made the 55places.com best-selling list. With a welcoming, friendly culture, low cost of living, and pleasurable climate, it’s easy to see why Texas is home to some of the country’s best places to retire. The state’s sheer size provides retirees a wide selection when deciding where to hang their hat. Active adults can settle near a big city, in a quaint town, or alongside the sparkling waters of the coast. We delved into the data on 55places.com to discover the top active adult communities in the Lone Star State. Read on for the 10 best-selling communities in Texas on 55places.com from July 2017 to June 2018. 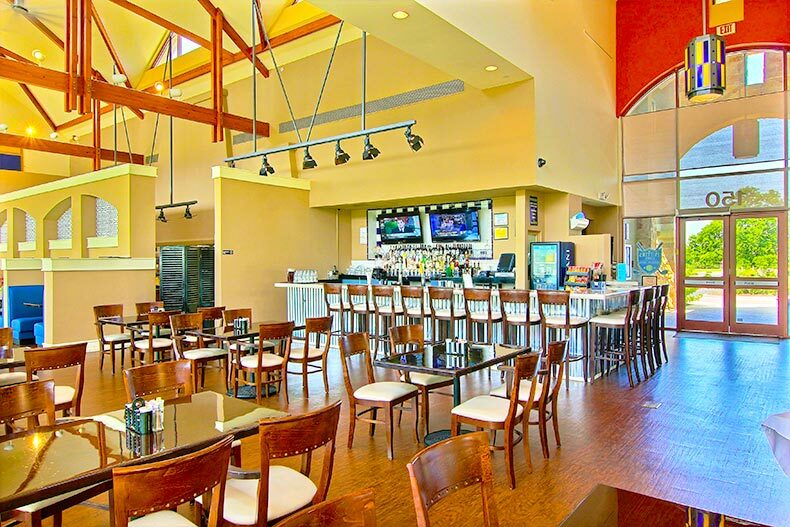 Putter's Cafe in Sun City Texas is a great place to grab a bite or watch the game. 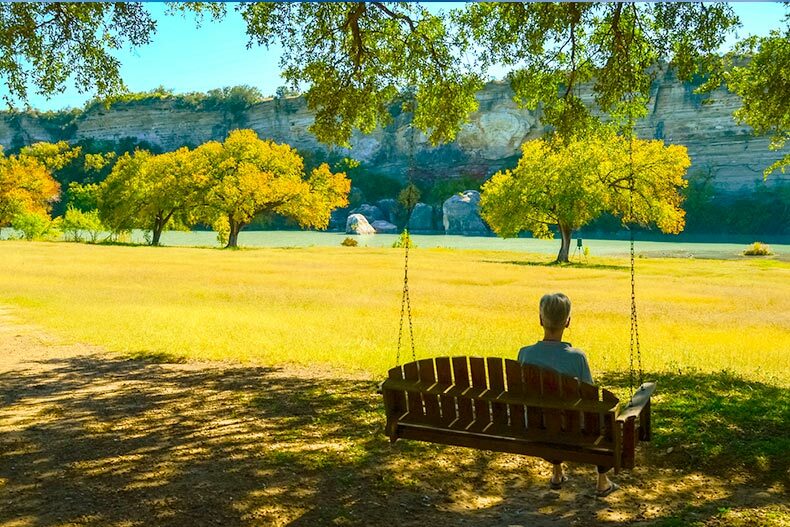 Topping our list is Sun City Texas, a vibrant 55+ community situated in the picturesque Texas Hill Country. As Texas’ largest active adult community, retirees can enjoy a lifestyle that’s as big as the state itself. The vibrant and manicured community has 9,900 homes, three championship 18-hole golf courses, and 86,000 square feet of world-class amenities. And with homes starting in the high $100s, the good life is accessible for many retirees. Just 35 miles north of Austin, residents are a short drive away from the shopping, dining, and entertainment in the state capitol. Situated deep in the heart of Texas in historic San Antonio, Hill Country Retreat is an oasis that provides sweeping views of wildlife, natural hills, and cascading waterfalls. Retirees flock to this 55+ community for a laid-back lifestyle with appealing amenities around every corner. Residents can enjoy the 28,000-square-foot clubhouse, called “The Resort,” catch up with neighbors in the billiards room, or stroll the miles of walking trails. Started in 2006, this age-restricted community will contain more than 2,000 single-family homes ranging in size from 1,109 to 2,691 square feet. Homes start in the low $200s. Active adults relish the plentiful amenities and natural beauty of Del Webb’s Frisco Lakes nestled along the shores of Lake Lewisville in the desirable city of Frisco. Here, residents can enjoy a variety of activities in the 28,000-square-foot Village Center and Sports Complex or hit the links at the stunning 18-hole, par-72 course that was designed by prominent golf course architects at Gary Stephenson Golf Design. Buyers can choose from several richly appointed homes that keep active adults in mind. Homes start in the mid $200s. Texans looking for down-home comfort and a relaxing lifestyle don’t have to look further than Del Webb Sweetgrass, an idyllic 55+ community located southwest of Houston in Richmond. The neighborhood opened in 2011 and will feature approximately 1,500 homes in 23 single-family floor plans. Buyers can choose from premium lots that offer tranquil views of water or green space. Homeowners can get some fresh air along the winding walking trails, socialize with friends at The Lodge, or take a short jaunt into downtown Houston to enjoy the big-city nightlife. Homes start in the high $100s. Active adults seeking a wealth of amenities and an exciting lifestyle will be right at home at the renowned gated community of Robson Ranch. Started in 2002, this age-restricted community in Denton will be home to about 7,200 residences upon completion. The community reserves a portion of the neighborhood for residents age 40 and older. Homeowners can participate in various events at the 17,500-square-foot clubhouse, stay active at a world-class fitness center, and express their creativity at a woodworking shop and ceramics studio. Golfers will appreciate the breathtaking par-72 course, which was designed by golf course architect Gary Stephenson. Homes start in the low $300s. CountryPlace in Pearland is a charming 55+ community with 841 single-family homes and townhomes. Retirees looking for low-maintenance living in a close-knit neighborhood will be right at home in this established, gated community. Planned activities such as bingo, quilting, and dominoes bring neighbors together, and proximity to Houston allows residents to take advantage of big-city offerings. Homes start in the mid $100s. Heritage Ranch in Fairview, just 30 miles north of Dallas, exudes Texas charm. This gated 50+ community is nestled on 575 acres alongside billowing trees, tranquil ponds, and rolling hills. The neighborhood contains an 18-hole, par-72 championship golf course that Arthur Hills designed, and is near major medical facilities, world-class shopping, and regional cultural centers. Residents can select from a wealth of activities or let the full-time activities director take the lead with classes, workshops, and trips. Homes start in the mid $200s. Retirees can enjoy a life of leisure at Isabella Village at Savannah, a 55+ master-planned community in Aubrey. Just 180 energy-efficient, ranch-style homes are catered specifically to for this age-restricted neighborhood, ensuring an intimate environment for active adults. Floor plans range from 1,212 to 2,398 square feet and allow buyers to customize with desirable upgrades and energy-efficient features. Homeowners relish the clubhouse’s luxurious amenities, including a well-stocked library, a three-story fitness center, and an inviting café with a juice bar. Homes start in the mid $200s. Active adults seeking modern homes in a vibrant neighborhood will find themselves enamored with Ladera Mansfield, a brand-new 55+ community in North Texas. Started in 2015, the community will offer 186 homes upon completion along with a 4,500-square-foot clubhouse. Buyers can select a floor plan to suit their specific style and budget, with homes ranging in size from 1,390 to 2,511 square feet. An association manages lawn maintenance and landscaping, allowing homeowners to enjoy their surroundings with peace of mind. Homes start in the mid $200s. Rounding out our list of the 10 best-selling communities in Texas is The Village at Tuscan Lakes in League City, where retirees experience a coveted mix of culture, comfort, and recreation. This gated 55+ community includes a majestic clubhouse, resort-style pool with beach entry, putting green, and a stocked pond. An activities director keeps the event calendar full, and with Houston and the Kemah Boardwalk just a few miles away, homeowners have a world of dining, recreation, and entertainment opportunities. Buyers can choose from three different home series to fit their preferences and budget. Homes start in the high $200s.